These free printable love coupons are a great gift for your sweetheart on Valentine's Day, a birthday, anniversary, Christmas, or any other special occasion. Some of these printable love coupons are filled out already while others are blank and you can decide what the coupon is for. Whichever of these printable love coupons you choose, your significant other, family member, or friend is going to love that you put so much time and thought into their gift. You won't even have to mention that you did it all for free. Tip: If these are for Valentine's Day then don't forget to pair these printable love coupons with a free printable Valentine's Day card. FTD by Design has a coupon book that has 30 love coupons inside that can be redeemed for a back rub, home-cooked meal, dinner out, a nap, day in pajamas, and many more. This beautiful love coupon book is decorated in mint, teal, and coral. The printable includes the front and back cover, the coupons, and some blank coupons that you can fill in yourself. The coupons included are for a lunch date, movie night, weekend getaway, breakfast in bed, date night, a day without chores, and a dessert night. You can also create your own. These printable love coupons come in three different versions — for kids, adults, and ones that are blank. These are some adorable printable love coupons that can be yours for free. The free love coupons include a cuddle, home-cooked meal, dinner and a movie, a day without chores, weekend getaway, dinner, hug and kiss, and a favor. These free, printable love coupons contain coupons for breakfast in bed, movie night, candle-lit dinner, foot rub, and a back massage as well as plenty of blank coupons where you can add your own. The love coupons can be printed with a white background or a shaded background. Print these cute free, printable love coupons templates and then fill in your own sweet favor for your loved one. There's also a cute cover you can print for the front of your love coupon book. Mommy by Day Crafter by Night has created a lovely download of free printable love coupons which you can print out and then put together in a booklet. There are pre-made love coupons here for a romantic dinner, date to the movies, date for ice cream, massage, breakfast in bed, and a sports game, as well as plenty of blank love coupons for you to fill in. 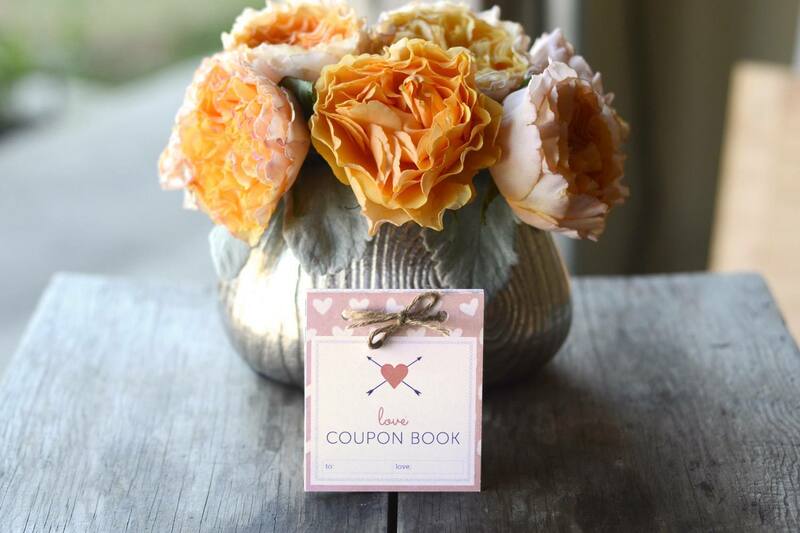 Make your loved one a complete love coupon book with these cute printables from Kiki & Company. You can download and print the love coupon cover books as well as the coupons that you can make out for anything you think the recipient would like. These adorable love coupons from The Country Chic Cottage come in purple, pink, and coral colors. All of them are left blank so you can fill in your own ideas. There's also a matching printable cover for the coupons, which you could leave off and use the coupons for other occasions than Valentine's Day. What Moms Love has designed three different love coupon books for Christmas, Hanukkah, and birthdays. These love coupons are designed to be given to children and include coupons for movie theater tickets, extra screen time, staying up late, dessert after breakfast, and more. You'll need to sign up for the free newsletter to get a link to the coupon printable. Here are some vintage inspired printable love coupons that would be great for any loved one. There's a printable cover for your coupons as well as decorative coupons where you write in the favor. The Frugal Girls have designed some printable love coupons perfect for the guy in your life. Print these love coupons out and use your imagination to make a cute little booklet. These are some simple printable love coupons in a pretty pink color that come from PrintablePartyKits.com. Print as many of the love coupons as you want and fill in who gets the coupon and what it's for. Boutique by Design has created a whole page of colorful love coupons that are just for the kids. They come in pink, blue, green, and orange. Some of the love coupons here include "Get Out of Time Out", "One Treat at the Grocery Store", and "Get Dessert Before the Meal". There's also a printable cover to go along with them. These adorable DIY love coupons are red and white and have cute details like a bar code and expiration date.